These ham and brie crostini are perfect for an appetizer or for a fancy toasts recipe which can be enjoyed at any time. Crostini are typically an appetizer consisting of small slices of grilled or toasted bread with toppings. I know if I’m at a party and there’s a fancy little appetizer that looks like a crostini, I’ll go right for it. BREAD! AND TOPPINGS! Am I right? 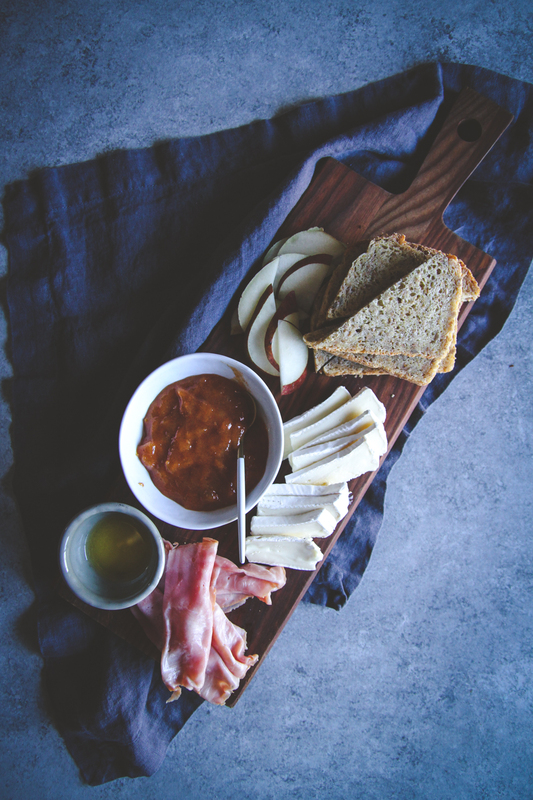 I’ve been so busy and crunched for time lately, that ‘fancy toasts’ as I like to call them have become a main dinner staple (or breakfast staple, like these ricotta pear almond honey toasts). 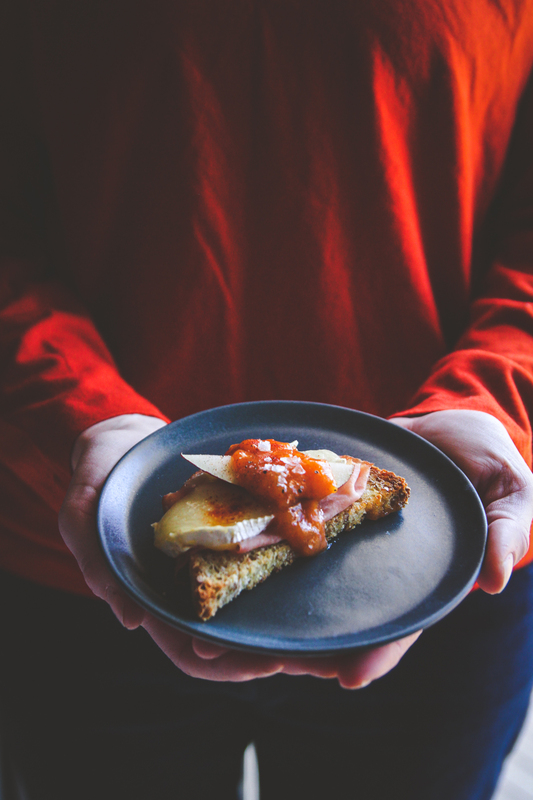 My fancy toasts are basically bread, with toppings, that’s why I’m calling these ham and brie crostini fancy toasts, because they can be enjoyed as either an appetizer, or as a main meal. We had just finished watching Top Chef where one of the contestants (Carrie Baird) won challenges with toasts (yes, the other contestants made fun of her, but who cares, she won, right?) and with toasts on my mind, and then seeing ham and brie, these toasts became a reality! I made them again when a friend came over, and we were going to serve them later for a party, but ended up eating them all as we were prepping them. 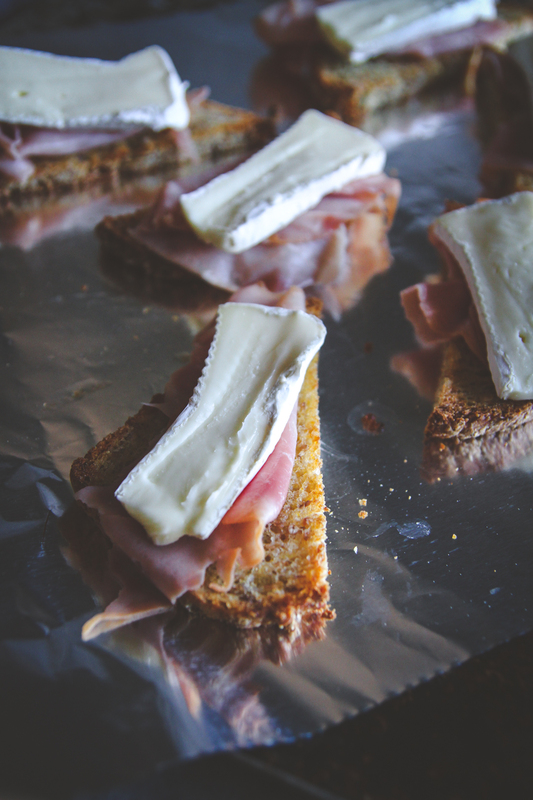 No joke, these ham and brie crostini are amazing. 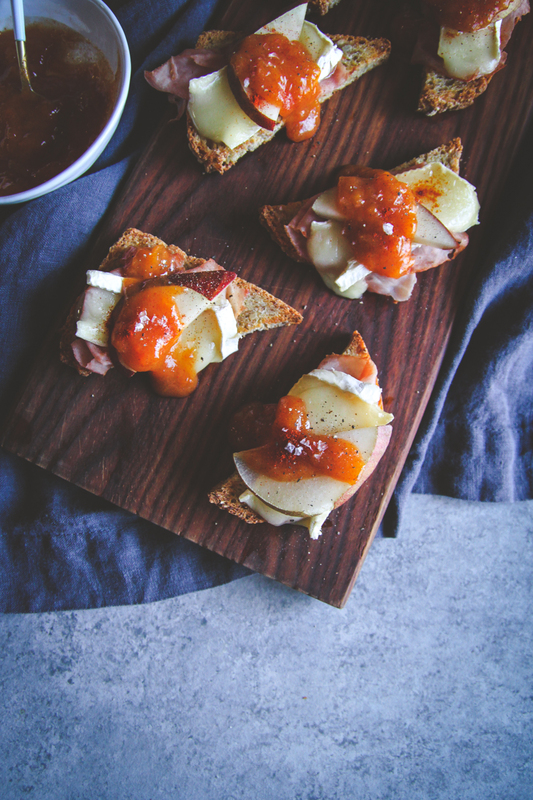 They’re made with super simple ingredients: ham, brie, bread, and are topped with a pear slice and then a dollop of sauce made from apricot jam and Dijon mustard and are dusted with paprika, salt and pepper. So good! 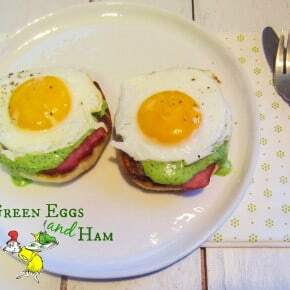 If you have any leftover ham from Easter, I would definitely say to try these toasts with leftover ham! Are you a fancy toast person? Preheat oven to 375 degrees. Line two baking sheets with aluminum foil/parchment paper or a nonstick mat. Brush melted butter on the bread slices and place on prepared baking sheet. Gently sprinkle garlic salt over bread. Bake for 10 minutes, until starting to turn light brown. 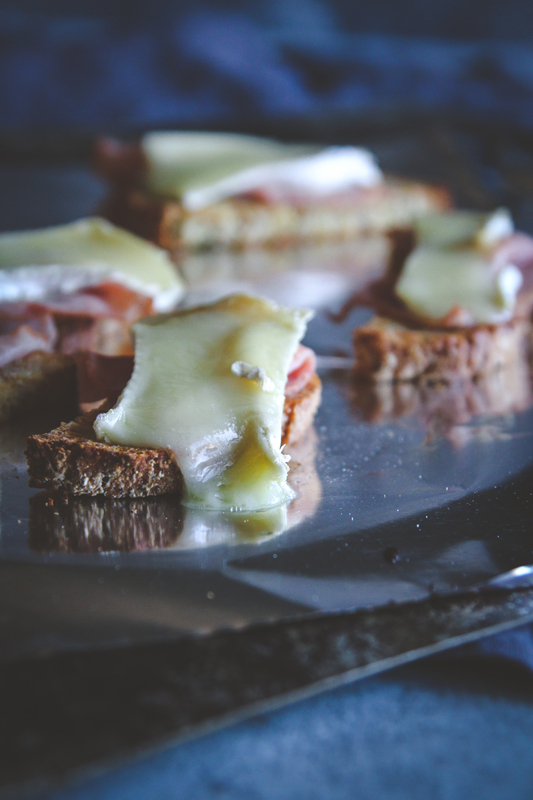 Top toast pieces with one slice of ham, and one slice of brie. 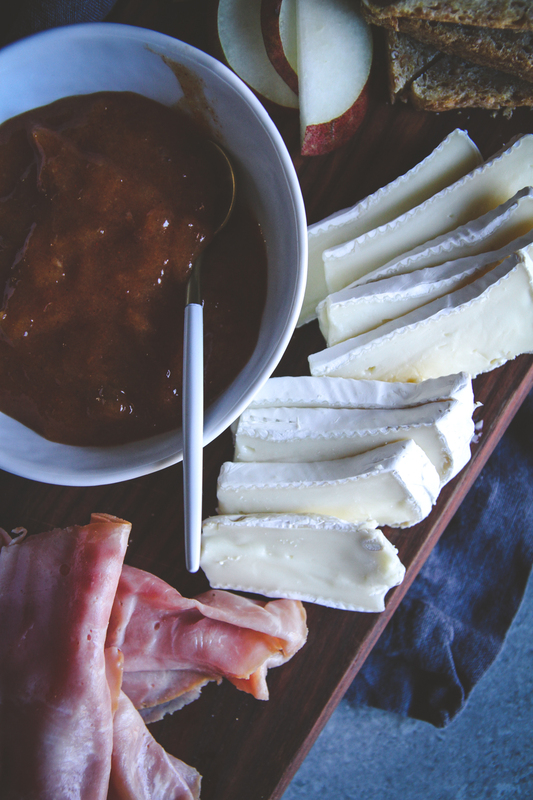 Bake for 5 minutes, or until the brie begins to melt. While the toasts bake, make the topping sauce. 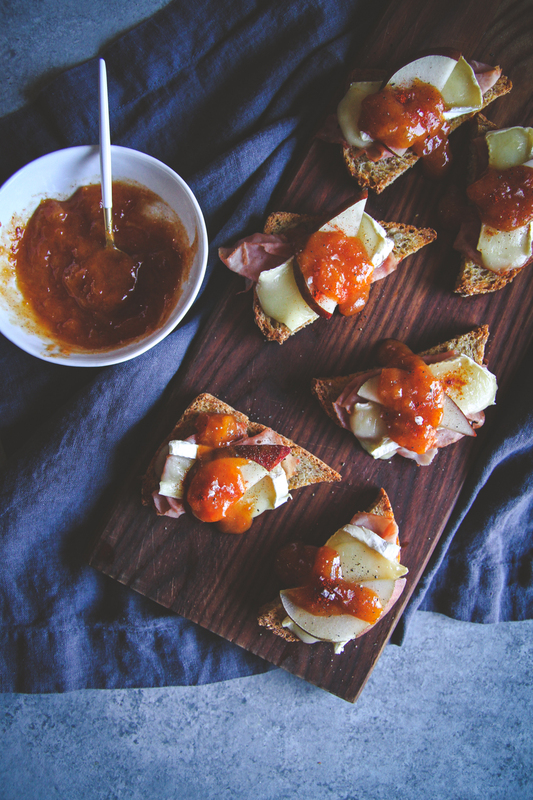 Mix together apricot preserves, Dijon mustard, and paprika. When the toasts come out of the oven, add a pear spice on top and then a small spoonful of the sauce, and a little pinch of salt and pepper.